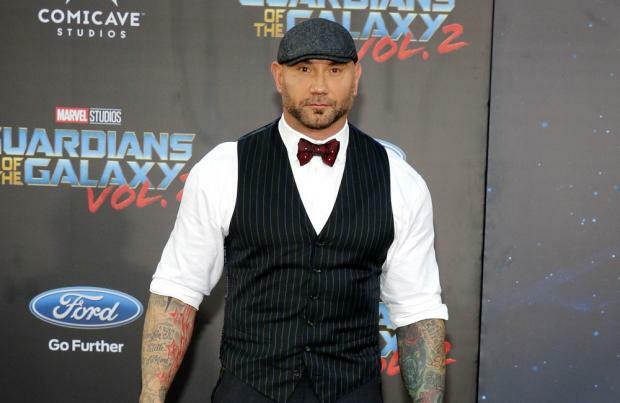 Dave Bautista has spoken out to defend James Gunn after the director was fired from 'Guardians of the Galaxy Vol. 3'. The 51-year-old filmmaker - who wrote and directed the first two installments of the film series - has been booted from the helm of the upcoming movie after offensive social media posts he had made in the past resurfaced online but the franchise's star has admitted he is "not OK" with the "loving and caring" helmsman's dismissal. He tweeted: "I will have more to say but for right now all I will say is this..@JamesGunn is one of the most loving,caring,good natured people I have ever met. He's gentle and kind and cares deeply for people and animals. He's made mistakes. We all have. Im NOT ok with what's happening to him (sic)"
'Ant-Man' actor David Dastmalchian didn't address the controversy but has also lend his support to the director of his 2016 horror-thriller 'The Belko Experiment'. He shared a photo of them together and wrote on Instagram: "i've been saying this FOR YEARS! @jamesgunn is one of the most amazing people i've ever known - both professionally & personally. there are so many people in our lives that we would never have known without the incredible magnet of talent & goodness that is james (& his awesome partner in life, @jenniferlholland). thanks for making us a part of your family, buddy. (sic)"
Comic Rufus Hound called out Walt Disney Studios for their decision to fire Gunn for his previous actions. He tweeted: "Disney, your stories are so often about redemption. To fire James Gunn for jokes made as a younger man, jokes for which he has already apologized, goes against the moral code you taught us all when we were kids. No sense in cutting loose a good man. I urge you - rehire him." Gunn previously issued his own statement on the incident, where he apologised for the comments he made in the past. He wrote on Twitter: "Many people who have followed my career know when I started, I viewed myself as a provocateur, making movies and telling jokes that were outrageous and taboo. As I have discussed publicly many times, as I've developed as a person, so has my work and my humor. It's not to say I'm better, but I am very, very different than I was a few years ago; today I try to root my work in love and connection and less in anger. My days saying something just because it's shocking and trying to get a reaction are over. "In the past, I have apologized for humor of mine that hurt people. I truly felt sorry and meant every word of my apologies. For the record, when I made these shocking jokes, I wasn't living them out. I know this is a weird statement to make, and seems obvious, but, still, here I am, saying it. Anyway, that's the completely honest truth: I used to make a lot of offensive jokes. I don't anymore. I don't blame my past self for this, but I like myself more and feel like a more full human being and creator today. Love you to you all. (sic)"